Basically, the method for making sure the world has a witness of the truth of Bible prophecy is the same as evangelization, and is revealed by Jesus in the Great Commision. Jesus trained His disciples for three years. When He was ready to return to His Father, He commanded them to go and teach what He had taught them. In P.A.S.S. we are following the same example. P.A.S.S. 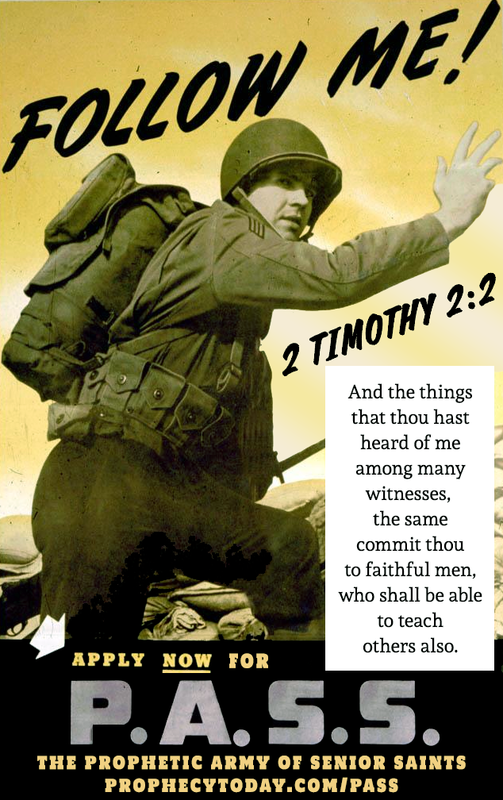 soldiers are taught the truths of God's prophetic Word, not simply for their own benefit, but so they will be equiped to go and teach - recruiting other fellow soldiers for good fight of the faith. As Paul said in our Mission Statement verse, what you learn here, teach others, so they can teach still more people. Or more simply put in 1 Corinthians 11:1, "Be ye followers of me, even as I also am of Christ."